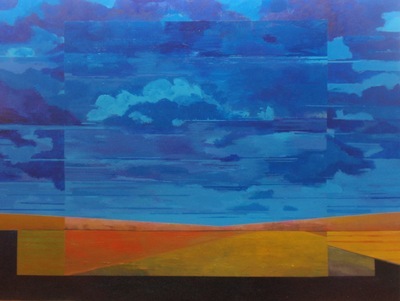 Mark Bowles, Ever Changing Landscape #2, Acrylic on Canvas, 60" x 80"
Whether I am working with a still life, the human figure, or landscape, I am always fascinated by texture, form and color which I use in expressing how I feel about what I am seeing. I do not limit myself in what I paint or how I might interpret what I see. This freedom allows my work to move from representational to minimalist to abstraction. My work is ever changing, ever challenging and always a passionate delight. It is always my intention to address the canvas directly, honestly, and boldly. My heart is always pushing my work to find new language in expressing what I see and how I feel about it. The result therefore is not just an intellectual exercise for me, it is being involved in the "Now"…always open for change and challenge...always evolving. Exploring color, composition, the quality and attitude of a line, as well as various materials will always fascinate and be tools for me. It is my goal to draw the viewer into my space and let them become involved in their own personal journey and discovery of the work. The ultimate reward for me is to communicate something new to the viewer even if for just a moment in time. Painting is my commitment, my passion and my fulfillment. I am honored by those who find inspiration from my work. 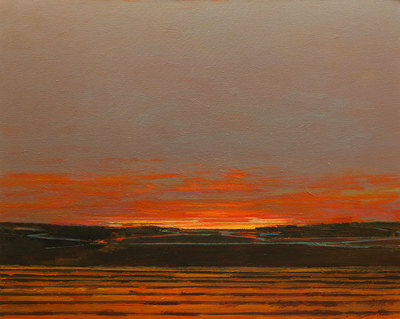 Mark Bowles, Sunset, Acrylic on Canvas, 40" x 50"
2001 - California State Fair, Award of Excellence, Sacramento CA. 2000-2001 - California State Fair, Award of Merit, Sacramento CA. California State Fair 2001, Award of Excellence, Sacramento CA.